I remember the day Uber came to town last fall. NYU’s Wagner School of Public Service has its home in the Puck Building on the southeast corner of Houston and Lafayette Streets. Across Lafayette is a rare sight: a gas station in the middle of Manhattan. Every day around shift-change time, it’s inundated with yellow cabs. On this day last fall, I saw young people signing up cabbies for Uber, showing them how to download the app on their smartphones and register. Best of all, Uber was picking up the tab for this first round of e-hailed NYC cabs! Before I had a chance to use it, UberTaxi had vanished, reports on the subject are not extremely clear on why they left, but it seems the TLC either misled them or intentionally made their operation more difficult, leading them to put ther energy into “more innovation-friendly cities”. This was a low blow to the NYC government, but raised a few eyebrows. A few months later, the TLC announced an e-hail Pilot Program, basically saying you can’t just roll into town with your technology… you have to play by our rules. Uber and Hail-O obliged, and the Pilot was set to begin at the end of April. The livery companies who operate black cars around the city (the only ones legally allowed to hav prearranged rides) sued the TLC in short order, saying that the new program would cut into their profits. They’re claiming a righteous crusade in the name of government checks and balances. I think “antitechnology obstructionists” actually fits pretty well. There’s always someone who will lsoe out when the government makes a regulatory change. The people want e-hailing, and they’re going to get it one way or the other. I think the livery companies should be coming up with a better way to coexist or adapt instead of fighting tooth and nail to maintain the status quo. This brings us to the colorful diagram I’ve included above. It’s a concept for an open source, universal ehailing platform. The idea is similar to Open311, a standardized platform for electronically submitting and tracking civic service requests. The protocol for Open311 is universal, so if someone writes an app for submitting reports in one city, in theory it can work anywhere that supports the Open311 protocol with only minor changes. 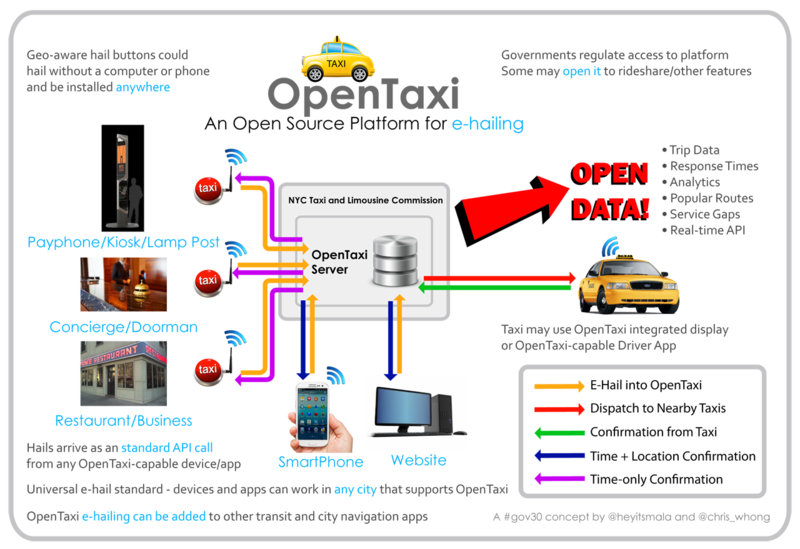 Requests could come from any OpenTaxi compatible app, and simple hail functionality could be built into any software application. Why stop there? We can make hardware devices for ehailing as well. As illustrated in the diagram, some sort of hailing button could be easily installed at concierge desks, payphones, kiosks, and lampposts. No smartphone? No problem! The devices would connect to the wireless data network and send an e-hail in the exact same way a smartphone app would, but without the phone. 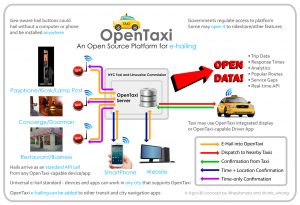 We could also implement metering and electornic payments through OpenTaxi. There’s much more to discuss, but this diagram lays out the basic premise. If many cities adopt a standardized plaform, apps and hardware that support it become universal as well. What do you think? Could it work? One Response to "Concept for an Open Source E-hailing Platform"